BORIS JOHNSON DUCKED out of a live Sky News interview yesterday when it turned into a quiz on the names of world leaders. Presenter Dermot Murnaghan had been accused of sexism back in September after similarly quizzing Shadow Foreign Secretary Emily Thornberry. 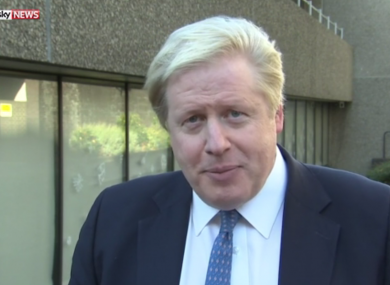 After discussing Brexit with Johnson, he said people had suggested he would not have given the foreign secretary the same treatment, following up by asking him the name of the French foreign minister. Laughing at first, Johnson said he would be happy to meet the presenter in the pub, if he wanted a pub quiz. But the French foreign minister is mon ami, Jean-Marc Ayrault. After launching into a speech about how his previously tense relationship with the French politican had blossomed, Johnson was then asked to name the South Korean president. “We are not getting into a pub quiz about leaders around the world and I’m going to, with great respect, invite you out to the pub Dermot, so we can take these conversations further,” he responded after a pause. The British foreign secretary then wished the presenter a good morning and walked off camera. Murnaghan managed to shout the correct answer – Park Geun-hye – at Johnson before he disappeared entirely. Email “Boris Johnson shuts down interview when asked name of South Korea's president”. Feedback on “Boris Johnson shuts down interview when asked name of South Korea's president”.